What if a heart valve could be replaced without surgically opening the chest cavity? That “what if” is now a reality for some patients. Replacing a heart valve with traditional surgery would require a large incision and dividing the breastbone. However, for certain patients, a heart valve can be replaced endovascularly using a wire and a new procedure called Transcatheter Aortic Valve Replacement, or TAVR. TAVR is a percutaneous procedure recently proven to be an appropriate alternative to standard medical care (a combination of careful observation, medications and balloon aortic valvuloplasty.) TAVR is appropriate for select patients with severe aortic stenosis (narrowing of the aortic valve opening) who are not candidates for surgery and those who are at very high risk. To be eligible for the TAVR, patients must have severe aortic stenosis (see sidebar) and be deemed not a candidate for traditional surgery. In the United States, TAVR continues to be studied as part of the PARTNER (Placement of Aortic Transcatheter Valves) trial which studied inoperable patients with severe symptomatic aortic stenosis. 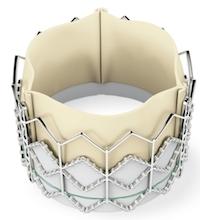 Compared to standard medical care, among the inoperable patients who had TAVR, the procedure reduced their absolute risk of dying by 20 percent. The risk of mortality decreased from 50 percent to 30 percent. Covenant Health has been selected as the only entity in Knoxville to have surgeons tarined in the TAVR procedure by Edwards Lifesciences.